born bibliophile: What's In A Name? Whether you like the name your parents gave you or not, it is a source of identification for you. When someone calls out your name, you answer to it. Your name is important. When you own something and you want others to know it's yours, you put your name on it. Think about it. It starts out when you're little. Your parents write your name on everything - sometimes, they even hang it up in your room. As you grow, you learn to write your name. You begin labeling the world around you so others know which stuff is your stuff. You put your name on toys, lunch boxes, notebooks, library cards, homework assignments, school gym clothes, athletic equipment, and so on. It doesn't stop when you get older. Heck, no. The stuff you have to put your name on just gets bigger and more expensive. If you own a house, there is a deed that has your name on it. If you own a car, your name is on the registration. If you lease an apartment or a car, there is still paperwork that shows you are the temporary owner. Like I said, your name is important. Where am I going with this? I'll tell you. I'm going to share a lesson I learned about names this summer. Now is the perfect time to blog about it because school is about to start again. For some of you, it may have already started. Yes, now is a good time to talk about names. 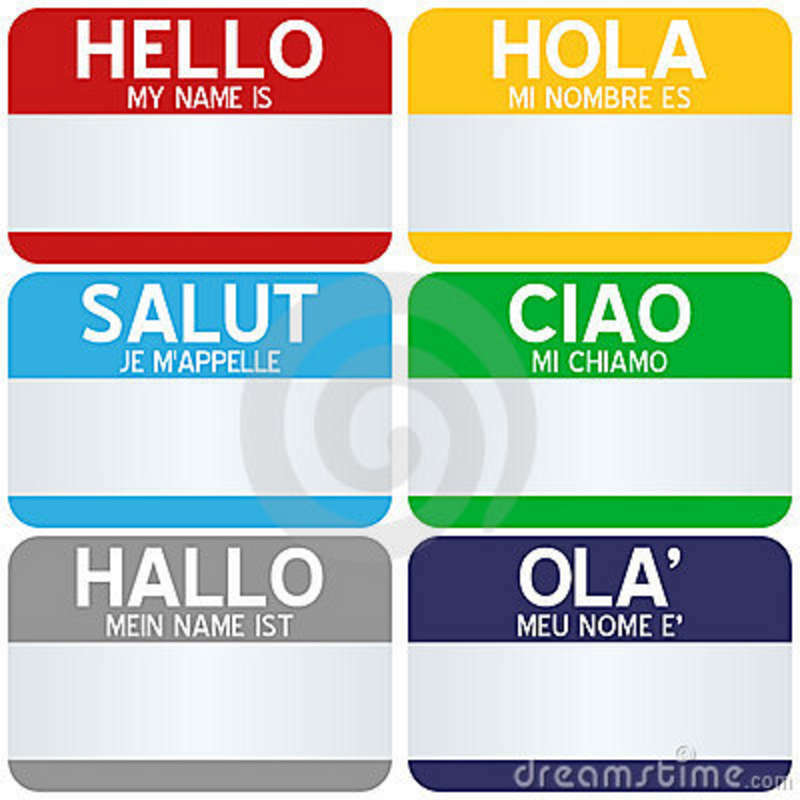 If you are a student, you will be meeting new teachers and making new friends,...and you'll need to learn their names. If you are a teacher, like I am, you will meet new students and welcome them to the learning environment of a classroom you will share with them over the school year. In case you didn't know, a school year is a long time to share a classroom with students, which is why we're going to talk about names. I took an educational workshop this summer which was great! The instructor was excellent, the ideas he shared were wonderful, and he gave us all some valuable tools for improving our teaching. Funny thing is, though, one of the most important things I learned was taught first thing, the first morning and the lesson was carried throughout the week. I'm still asking myself if the instructor taught it with intent or by accident. First morning of our class, the instructor had us pair up (in a class of 24) and briefly interview each other. This was an out-of-district workshop, so we were from all different school districts. We didn't know each other. He gave us basic questions to ask and added a couple of minutes for additional questions. After our interviews, he had us volunteer to stand up and introduce our partner to the class and tell something about them we'd learned. Our partner would then introduce us to the class. To encourage people to volunteer quickly, and not drag the exercise out too long, he said that when you stand to introduce your partner, you must FIRST say the names and re-introduce the people who were introduced before you. In other words, the first ones to volunteer would have less names to remember than the last ones. The last pair would have to introduce the first 22 before introducing each other. 1) The instructor did not do this to test our memory skills. He did it to help us get to know each other and give us a sense of community. It's an important thing to do when you've thrown 24 adult teachers together in the middle of their summer vacation, and you only have a week to give them something worthwhile. Before I go any further, I want to say that I wish I could have videotaped what happened next. I don't think any words I use will truly do justice to the lesson, but I will try. You see, the same thing happened with a group of college educated adults as happens with a group of sixth graders (or any grade level you'd like to insert). Yes, I know it shouldn't happen that way,...but it does. As Mark Twain said, "Truth is stranger than fiction." The introductions started off easy enough. The first ones to go had the easiest time, of course, before some started to panic and tried to raise their hands the fastest to try to get it over with. I decided to let my partner choose when she was ready for us to volunteer. I was ready at any time, but she was rather shy and quiet. I gave her the lead. As we sat and watched others introduced, I saw many different types of "students" in the teachers. There were a few adults who did as the instructor asked and used notes they'd made to make sure they got the introductions correct. Some had drawn blocks for seats and inserted names. Others had used numbers on the seats to remember who was who. They used their notes when they introduced, but looked up from the notes and acknowledged the others. Out of 24 adult teachers, there were 6 who did this. As for the rest of the class, it was...a circus of excuses. One guy stood and said he just didn't do it. He pointed to his partner and said, "She can do it. I didn't see the point." Another teacher pointed to her partner and said, "Yeah, what she said," then chuckled and went on with introducing her partner. One teacher actually said, "I'm a Special Ed teacher, so I don't HAVE to do it." There were several who had written down the names on a list, without knowing who was who, and stood to quickly read their list - never acknowledging who the person was - it was just a name on a piece of paper. Now, if you're wondering where I fit in to this scheme, I'll tell you. First of all, I had an unfair advantage over most of these people. You see, I already knew the importance of someone's name. I love words, after all, and names are words...and - as I've already stated to make sure you get my point - names are important. My first priority, as a teacher, is to learn my students' names (and know them well) as quickly as possible. I know how I learn best, so I used the same method for the instructor's exercise as I do in my classroom. When people began introducing each other, I wrote down their names on a piece of paper. I looked at the written name and looked at the person. I didn't glance at them, I really looked at them and paid attention to who they were and how their partner described them. I then looked at the name again - seeing it written has always helped me. I am also a spatial learner, so I paid attention to where that person was located in the room from where I was seated. As each person stood and introduced the rest of the class, I practiced in my head remembering who was who. I took a deep breath and began my introductions at the back of the room. I went in order of their seats and introduced each person. I made eye contact with them when I said their names. I smiled at them, with my mouth and with my eyes, and let them know I knew who they were. I took my time, I didn't rush. Everyone responded well to my introductions, they all smiled back. They also seemed to silently cheer, as the introduction list got longer, that I would make it to the end without a mistake. I saw encouraging looks and the sparkle of anticipation in the next person's eyes I met - hoping I would get their name correct...and a look of relief and happiness when I did. I have to point out that the "toughest case" in the room was a teacher who'd been teaching many years and was older than me. She was one of the ones who'd read the names off quickly from a list and never made eye contact with anyone. She sat on the second back row and had already shown pride in her sharp tongue that morning. She had a lovely name and, when I spoke it and smiled at her, it was evident I liked the pleasant sound of it coming from my lips. She beamed at me like a kindergarten student on the first day of school when they hear the teacher call their name! She loved being acknowledged, knowing I knew who she was, and that I had said her name correctly and in a loving manner. Still grinning at me, she even gave me a nod of approval at the end. Of all the "naming" moments, I will never forget that one. I will never forget that teacher's name or what she taught me. No matter who you are or what walk of life you come from, you want someone to know your name. If you spend any length of time with them (say, daily class time? ), you expect them to know your name. You want it pronounced correctly. You want to be acknowledged. We all do. When someone knows your name, it means they notice you. It means you are important enough that they took the time and effort to learn one simple truth about you - your name. I would also like to point out how our instructor, like any great teacher, played the introduction game with us - taking his turn at re-introducing people a few times during the process. He modeled his expectations. He would even add something extra he'd noticed from an introduction, too, like "This is Caren with a C, who loves Twizzlers!" At the end of all the introductions, he went back and re-introduced each person in a quick, fun, casual way. He was learning as we were learning. Throughout the workshop, he always addressed us by our names. If you're a teacher, it's imperative you recognize your students and know their names. There is a level of respect you are showing a child, the same respect you'd like from them, when you know their name and say it correctly. You need to have a good relationship with your students in order to maximize their ability to learn from you. It's important...to all of us. While I chose to use my 19-year-old daughter's kindergarten photos to illustrate this blog, I want to be sure and state I am a middle school teacher. I have had up to 140 students in a school year and, yes, I always learn their names (first and last), know how to spell them, and how to pronounce them. If it is a difficult name for me to pronounce, I practice and let the student know I'm trying and to be a little patient with me until I get it exactly right. I use all the things I mentioned to help me learn. I find that writing the name down in a seating chart gives me both a visual of the name and a spatial reference to the student. I also do what our instructor did, saying the name of a student every chance I get. By the end of the first week of school, I usually know most of my students' names. Why? You should have guessed by now - because it's important to my students, which means it is important to me. I love this blog, as I do all of your blogs! It is quite interesting to read this from the perspective of a teacher. I always find it interesting when we as adults pull some of the same manuevers that we complain about in adolescents. This particular blog also reminded me of "The Name of The Wind," and how important true names are. Thank you, Laura! :) Yes, it is always interesting to see what kind of student a teacher is when they aren't the one giving the lesson. To me, a teacher should be an example of the best student, and a teacher should always be excited to learn something new. I'm glad you mentioned the tie-in to "The Name of the Wind," it reminded me that there was another book I read this summer regarding the importance of our names - "The True Story of Hansel and Gretel" had to do with a boy and girl having to assume names (for protection) that weren't theirs and how they missed their real names, hearing their real names, being identified as who they really were. Amazing historical fiction story. You were right on point here and I think that is what makes you a people person. It is always welcoming to go where "Everybody Knows Your Name" as the Cheers theme song stated.